Daphine Abaho, Peer Educator with Mildmay Uganda, was the first guest speaker at the 2017 Irish Aid Professor Father Michael Kelly Lecture on HIV and AIDS. Please click below to watch Daphine’s moving and informative address, and scroll down to read her address in full. My name is Daphine Abaho. I am from Uganda. I am 22 years old and I live with HIV. I am a volunteer peer educator and I work with Mildmay Uganda. I welcome you to visit my beautiful country and to visit Mildmay. I thank you in a special way for choosing to come here today. Like someone – I do not know who – once said; broken Irish is better than clever English. Thank you – go raibh maith agat – thank you. Thank you. On behalf of the young people of the world, especially in Uganda and other developing countries where I come from, who live with HIV and so suffer its effects; on behalf of the adolescents and the young men and women with HIV at Mildmay Uganda’s Centre of Excellence for HIV prevention, care, and treatment, and on behalf of all children with HIV especially those born and so live with it not out of their making, I am profoundly honoured to be accorded the opportunity to stand before you. How I wish you could open my heart and see that I am happy! You know, I come from a tribe of a people for whom happiness on their faces and eyes may not easily come naturally! But I am happy. Indeed, it is a privilege for me to address the The Irish Aid Annual Prof. Fr. Michael Kelly Lecture on HIV and AIDS, because, mine – ours, as you know – is a story of an unwavering hope in despair, of solace in the face of animosity, and of resilience and steadfastness in adversity. Permit me to thank the gorgeous Nadine for inviting me to speak at this most noble forum. You know I am a most unlikely candidate for this; there are thousands of young people living with HIV who have hugely amazing stories and for me to be chosen to speak for them is of a singular honour. Thank you, Nadine, Steve, Nicola and Vincent. I am humbled that Irish Aid invited me to come here. I am indebted to your generosity, to your service for humanity, and to your work. And you know Irish Aid is one of my country’s biggest donor partners. Thank you. I thank Fr. Michael Kelly for his work on HIV/AIDS. I thank him particularly for his work in Africa. Thank you, Father. Permit me, also, to express my deeply sincere gratitude to the International HIV/AIDS Alliance who profiled my story. Thank you, Gemma. Thank you, Georgina. Thank you Laura, thank you Lora. Thank you to everybody. I am thinking in a particular way of my Mildmay Uganda family back at home, without whose continued care, perhaps, I wouldn’t be here, maybe I wouldn’t have a life. Thank you Dr Barbara Mukasa and your team. Thank you. Thank you, above all, for bearing me. Thank you again. Lastly, but certainly not the least, join me in thanking the global family – governments, organisations, and foundations – for your efforts in combatting HIV. You have given me a life. We are gathered in this place to think on YOUNG PEOPLE AND HIV. It is a unique moment in the era of HIV. As you well know, young people under the age of 14 years constitute a quarter of the world’s population while those between 15 and 24 years of age constitute almost a fifth. Uganda’s youths are the youngest population in the world; in fact, 77% of our population is under 30 years of age implying most of it is dependent! Now, look, the unemployment rate for young people aged 15 to 24 years of age in Uganda is a shocking 83%! Meanwhile, access to education in my country is still low; for every ten students enrolled into primary school, only one is enrolled into secondary. Uganda’s HIV prevalence is 6.5%. We know that HIV disproportionately affects the female gender; the HIV prevalence among women in Uganda is 3.8% while that among men is 1.9%. In fact, 570 young women aged 15 to 24 years acquire HIV every week! I would like you, ladies and gentlemen, to think very deeply on these numbers. Let us also note, ladies and gentlemen, that a multitude of children are still born with HIV in this age. You will, then, ask how I got HIV and how I did get along. I was born a lone child with HIV two decades ago in a village in the south-western part of Uganda, near the famed Mgahinga National Park with its beautiful mountain gorillas. When I was born I did not know my father for he walked away on us, he has remained, but, a dream. I know he’s dead because I was told that I buried him – although I did not know him. I do not know how he acquired HIV. There were no programs for Prevention of Mother-To-Child Transmission of HIV in my village. Because my father was away, my mother had to work to fend for me. She went off to the city to look for work when I was five. She did odd jobs including vending ill-preserved foodstuffs to travellers, hawking used and damped – or ‘second hand’ – clothes – as we call them back home. She earned about 90 US Dollars per month. This was very little for me to have an education that would be meaningful. During this time up until the age of twelve I grew up with my grandmother who has since passed on. Later on I did join my mother and went to city schools. We did not own property in the city but mother worked and bought a house in the village. My grandmother lived in the house until she died. Because she had full-blown AIDS, when I was seventeen, mother succumbed to it and died. It was a most defining moment in my life. Just to dwell a bit on what happened after that. In many parts of my country women and girls do not have rights to property because of their gender. Our ‘caste’ society considers them ‘second class’ citizens. Shortly after we buried her, my aunties on my mother’s side took up the property and sold it off. I would learn, later, that mother had borrowed some money from them in order to fend for me. I dropped out of secondary school when she died. I stayed with my aunties for a year until they threw me out. Life challenged me; because I was very vulnerable, as you may know, life’s challenges hit me head on. To take you back a little bit, I discovered that I had HIV in 2004 at the age of eight when I was brought to the then Mildmay Center in Uganda having suffered a condition that health facilities in my village could not treat. I was enrolled onto treatment – to this day, by the way. I suffered a low self-esteem. I suffered negativity and anguish. I felt isolated from my peers and from society. I contemplated suicide; it was so tough the stigma I faced, you can only imagine. Once, I just stopped taking my medication and wished I could die and be where my mother was. Because of my decision to get off medication, I fell very ill. I failed on first line treatment. I was going to die. At this point I am thinking particularly of Dr. Ivy Kasirye a Paediatrician who was in charge of the Paediatric Ward at Mildmay Uganda. Dr. Ivy treated me and took care of me, I am indebted. More important, though, is that she gave me reason to live, she supported me morally. Once she told me I would be a light to young people who have lost hope due to HIV, and that I would never know where the world and its endless opportunity would lead me. HERE I AM BEFORE YOU IN DUBLIN. You know in the part of the world where I come from we attach a lot of meaning to travelling. Dr. Ivy became a huge model for me. Thank you Dr. Ivy. Life became better for I found reason to live. Not that opportunity came my way, but I began to see life differently. I started taking my medication again. I disclosed my status to other young people, I took a personal decision to live a positive life. The anguish has since gone; the negativity has vanished. Now I live with esteem. Therefore, I stand here today to share with you my story. I stand here today for the millions of young people who live with HIV to echo their quest for equity. I stand here knowing that my story will be a voice for them who suffer ridicule and reproach. I stand here knowing that there is a brighter day tomorrow. I stand here to address HIV through bridging gender inequality, through keeping adolescent girls and young women free of HIV, fronting social justice in the face of injustice, creating systems that protect the rights of minors, and addressing barriers to an HIV free world. I am thinking of my friend Mariam, who as a twelve-year-old village girl, was raped on her way from a well to fetch water for the family and infected with HIV over a decade ago. 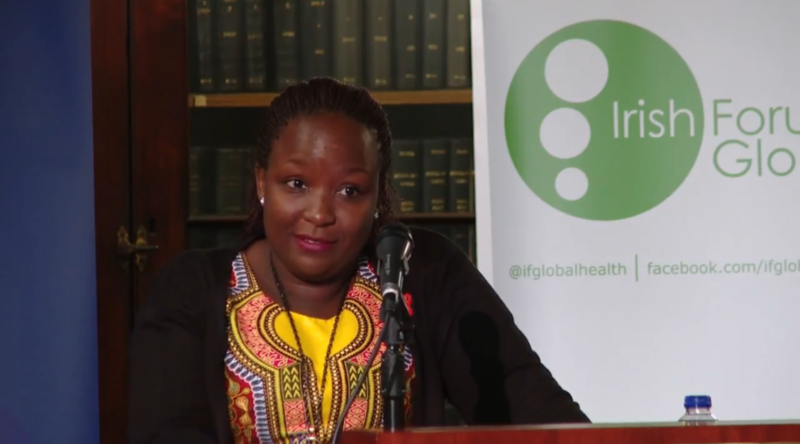 She became pregnant and gave birth to a beautiful baby – girl free of HIV. The authorities, it is alleged, took a bribe from the sexual offender, released him from his prison cell almost as soon as he had been locked up, and left the village to never be seen to this day. Mariam’s family abandoned her and so could not continue with her education. She found work as a volunteer peer educator to young people with HIV, earning about 60 US Dollars per month. She thought she would pay her fees and go back to school but then that would not be enough for her and for her child who is now about 8 years old. She has decided to keep her daughter in school. But then she cannot get a regular job, let alone a well-paying one. Her daughter will certainly drop out if she is not helped. That, too, is my story; I earn just over 60 US Dollars per month from the work I do as a volunteer peer educator to young people with HIV; it is impossible for me to go back to school, let alone pay for my house rent. I am indebted, at this juncture, to a friend of my late mother – I call him ‘Uncle Brian’ – and his family, in whose house I stay and do not have to pay rent – for now. I am also indebted to Mildmay Uganda where Mariam and I work as volunteer peer educators – for now for we do not know what the future holds. I implore governments, NGOs, the civil society fraternity, religious organisations, men and women of good will to press on, to do more. For people who are like me, we need more. In my country, the deficit for life-saving therapy, for behavioural and psychosocial support, for antiretroviral medicines is well over 50%. There is need for support for peer education, for more DAPHINES to do this work. I need to go back to school, I want to be a counsellor. Organisations like mine – Mildmay Uganda – need more support; there is a huge deficit for our HIV programs. The work is enormous. I further recommend that we front human rights, both basic and fundamental, for we need a renewed emphasis on these or we risk reversing the gains. Without the right to information, or to health, or to an education, or even to proper nutrition or to a habitat, we cannot end HIV. To the young people all over the world living with HIV, I say again; I am Daphine and I have HIV. I have lived with it for 22 years. My advice to you is; do not feel disaffected and alienated. I am on treatment. It is not the end of your life. You still have a bright future to live however obscure it may seem. Ladies and gentlemen, once again I am honoured to be with you here today. I dream of a world free of HIV for the children of the future. I wake up every day to contribute to that life through my work with young people at Mildmay Uganda. I ‘LOVE A POSITIVE LIFE’. Like Fr. Michael Kelly I ask you to spread the message of strength, dignity, and hope for those affected and at risk and to work to avert HIV. Humanity will celebrate the promise of our work.